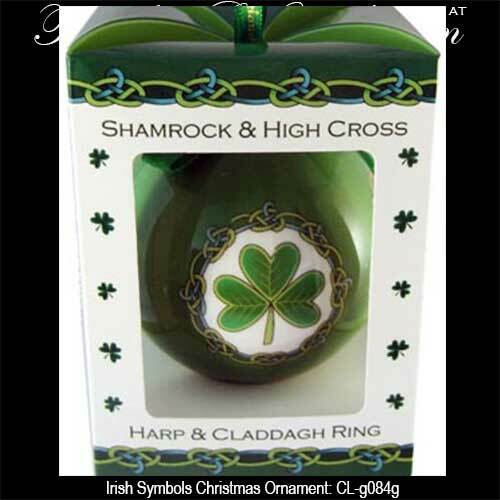 Irish Christmas ornament features the Claddagh and shamrock along with the Celtic cross and harp. This Irish Christmas ornament features symbols of Ireland's rich and ancient heritage that include the shamrock and the Celtic cross which mark the arrival of Christianity to the island. The harp was on the coat of arms of the King of Ireland as early as the 13th century and the Claddagh dates from over 400 years ago. This Irish Christmas ornament features a colorful art decoupage design that is enhanced with symbols of Ireland that include the Claddagh and harp along with the Celtic cross and shamrock. The 3" diameter bauble has a four sided design and it is ready to hang on your tree with the included Irish themed ribbon. 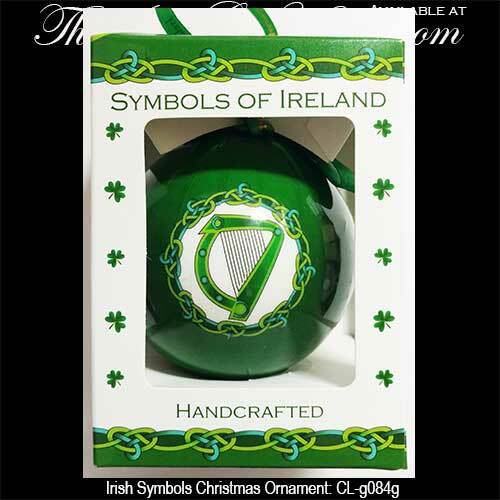 The Irish symbols Christmas ornament is attractively gift boxes with a brief history of the iconic designs. 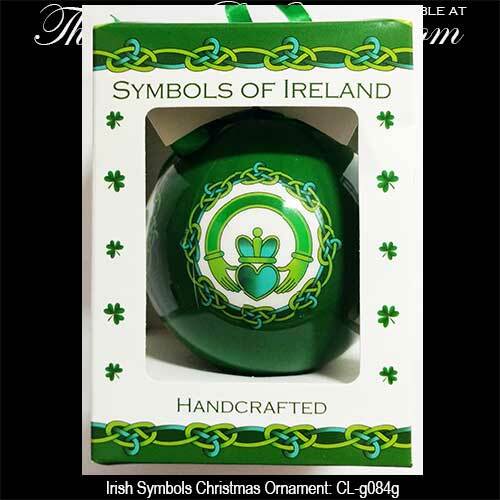 The Irish Christmas bauble is made in Ireland by Clara and it is received with Claddagh, shamrock and Celtic knot history cards that are complements of The Irish Gift House. The technique used in making this Irish ornament is called art decoupage. This is the Victorian craft of cutting out motifs from paper, applying them to a surface and covering with as many layers of varnish as is required to give a completely smooth finish. Irish Christmas tree ornament features the Claddagh symbol along with Celtic knot-work. Christmas tree ornament features the Irish welcome of Céad Míle Fáilte along with Celtic knot-work. Irish Christmas ornament features shamrocks that are enhanced with a Celtic knot motif. Christmas tree ornament features Irish sheep along with shamrock accenting.